By Xah Lee. Date: 2017-03-17 .
some light remark of heavy breathing! by the way, ES2015, the js standard, is so big that it's twice as large than previous. It adds to js features basically anything you'd find in Python or Ruby. Though, the true nasty JS warts, complexity, isn't fixed, since js is backward compatible. • look at the top 10, those are the bread winners. You can draw a circle of that radius centered on top right corner. JS Java, PHP, python, Ruby, C#, C++, C, Objective-C. Interesting is that CSS is also there, yet not HTML. Wonder how that'd be. Objective-C's rise almost a decade ago is mostly due to it being the only game if you want to play in Apple's iPhone money tree garden. Python's original rise has a lot to do with Google picking it as its scripting lang, back around 2000. Google pushed it into mainstream. • PHP still strong, despite 2 decades of hate speech from elite hackers. • perl still refuse to die, even one don't hear about it for a decade in geek circles. • also surprising is powershell , looks like it's finally taking over scripting on Microsoft Windows, as it should. (from what i see, it's more powerful than perl, and can use as a shell a la bash.) Replacing the multi-rehashed cmd.exe since DOS. • Surprise that golang is below swift and scala. Golang is superb. I deem it the best general purpose lang today. Faster than any functional languages, and in my opinion, in the hands of expert, is as robust or correct than any haskell ocaml fsharpe. Also, it's extremely simple, and easy to learn, and with superb documentation. • Not sure why Scala is popular. I suppose it's the only 1 of 2 escape route of Java coders. The other is clojure. • Clojure, i've coded intensively for about 6 months, read all its docs. Of all languages i learned in my life, clojure is the biggest disappointment. I think the only real reason clojure use is due to it being the escape route of java coders. Also, Clojure is enterprise language. That is, the kinda things Java do. Business stuff, full of bloat for the money in every corner. Swift is Apple's replacement of the ill Objective-C (which was the umpteenth effort of trying to add OOP to C, of which, C++ won.). Swift's popularly is backed by iPhone. Basically the only choice if you want to play there. look at the top 10, those are the bread winners. php still strong! and perl still refuse to die, even one don't hear about it for years. also surprising is powershell , looks like it's finally taking over scripting on Microsoft Windows, as it should. Replacing the cmd.exe. 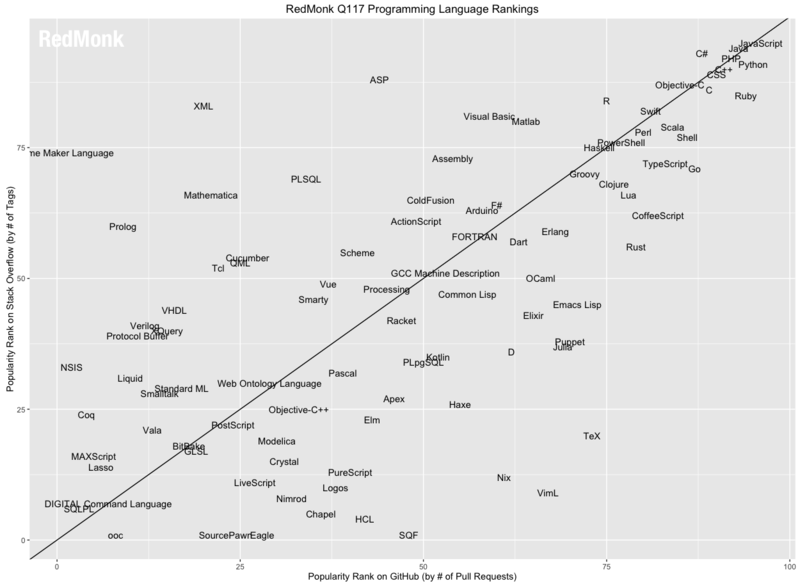 Surprise that golang is below swift and scala.